We will put you in the center of the huge pools, Jack Nicklaus golf, Mayan ruins, Caribbean snorkeling, Mexican resort town of Playa del Carmen, and adventure tours. We make it possible for you to escape the clamor of Cancun and head south to the Mayan Palace Riviera Maya (formerly the Mayan Palace Cancun) isn't in Cancun! 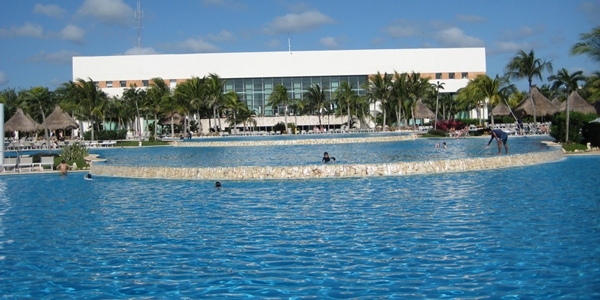 Even better, it's on the Riviera Maya, about 30 minutes from Cancun near Playa del Carmen. The resort is located on it's own private beach right on the azure Caribbean. You can easily spend the entire week at the resort. Five great restaurants, a variety of activities and sports equipment rental are on site. Imagine yourself under a palapas (thatch shelter) next to the largest pool in Latin America. If you do want to get off the resort, the Riviera Maya location of the Mayan Palace Cancun is a perfect base for exploring the Yucatan peninsula. What's to explore? snorkel and diving sites all are nearby. Playa del Carmen is a destination of it's own. Entertainment and eating options are basically unlimited in Playa del Carmen. From popular chains like Senor Frog and Fridays to unique Mexico experiences like Cafe Media Luna, to Yaxche for exotic Mayan cuisine. You can explore the Riviera Maya from here by renting a car for the week at the Cancun airport, or rent by the day in Playa del Carmen, or skip the driving and take a couple Riviera Maya tours.